This website is no longer the official website of the Richmond Birdwing Conservation Network. It was developed for the Richmond Birddwing Recovery Network. The author has continued to maintain it in recognition of the efforts of the many volunteers involved in the project and in the collection of the wild and planted vines and butterfly sightings. This page was taken from the old web site. It will be enhanced considerably to provide a pictorial reference and identification guide for these vines. P. laheyana grows in rain forests generally above an altitude of 600m. 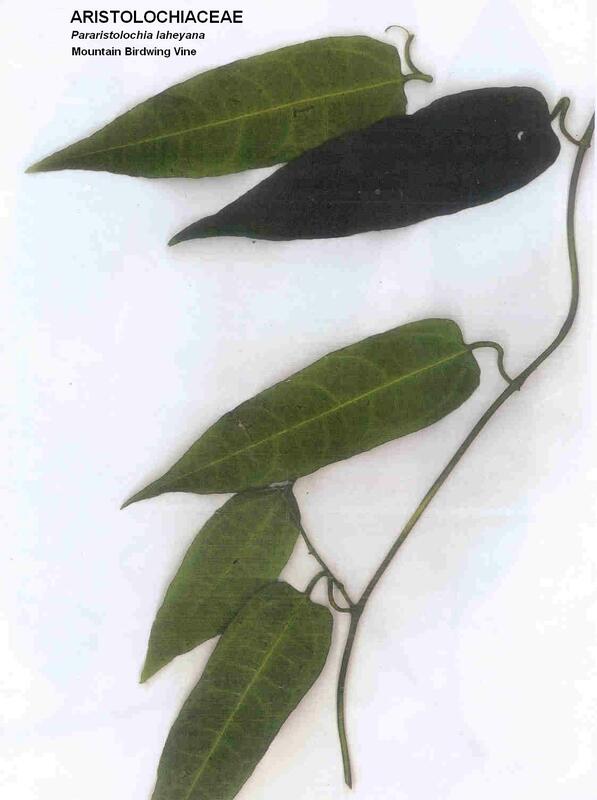 The leaves of the vine are narrower and generally shorter than P. praevenosa, the vine mostly sold as the Birdwing Vine in Southern Queensland and Northern NSW. Generally the leaves are softer than the lowland vine although older leaves can be tough. The top surface of the leaves is quite shiny and has far fewer hairs than P. praevenosa. Leaves are alternate, and the petiole generally is quite kinked. The clasp where the petiole connects to the stem almost extends completely around the stem. The bark on the older stems or trunks of the vine becomes corky in appearance. The stems do not reach the thickness of P. praeveonsa. The thickest I have seen is about 3cm, while P.praevenosa can grow to the thickness of a man's forearm. P.laheyana has pipe flowers similar in appearance to those of P. praevenosa. Pollination is performed by a small, unidentified fly which appears to become trapped in the flower over night apparently in its search for a mate. The seed elongated cylindrical seed capsule forms at the base of the flower once pollination has occurred. It takes many months to develop. A mature seed capsule, light green to yellow in colour, may contain between 30 and 60 small brown to black heart shaped seeds. Ripened seed capsules fall to the ground, where they are found by scrub turkeys which break them open, consume the flesh and scatter the seeds. As the turkeys scratch through the litter on the forest floor, they cover the seeds, virtually planting them. This primitive and limited dispersal mechanism is partly responsible for the slow natural distribution of the vine througout its range. Once wild viines are removed from their natural habitat, they are very slow to reproduce and re-colonize these areas. Furthermore the seed is only viable for a few months. 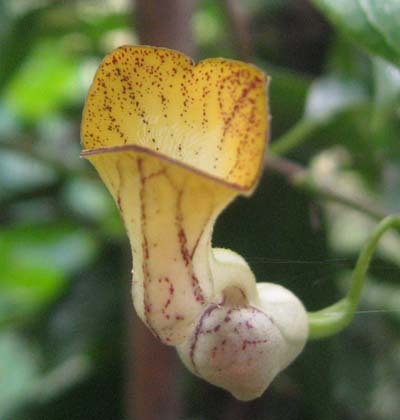 Compare this to the North Queensland vine, Aristolochia acuminata, commonly known as Tagala vine. It is the larval host vine for the Cairns Birdwing Butterfly. In the north, it is also known as the Birdwing Vine. Unlike Pararistolochias, Aristolochia seed capsules burst open on the vine. Their seed is wind dispersed and not reliant on bird distribution. Hence the Cairns Birdwing and its host vine are not under threat. Note: Tagala (Aristolochia acumiinata) is NOT suitable as a host plant for Richmond Birdwing Butterfly larvae. Eggs of Richmond Birdwing laid on Tagala vine rarely develop properly. Pictures taken from the booklet "Identification & Propagation of Birdwing Vines" used in the Land for Wildlife workshop at Mary Cairncross Scenic Reserve in 2006. Copyright 2007 Richmond Birdwing Recovery Network Inc.